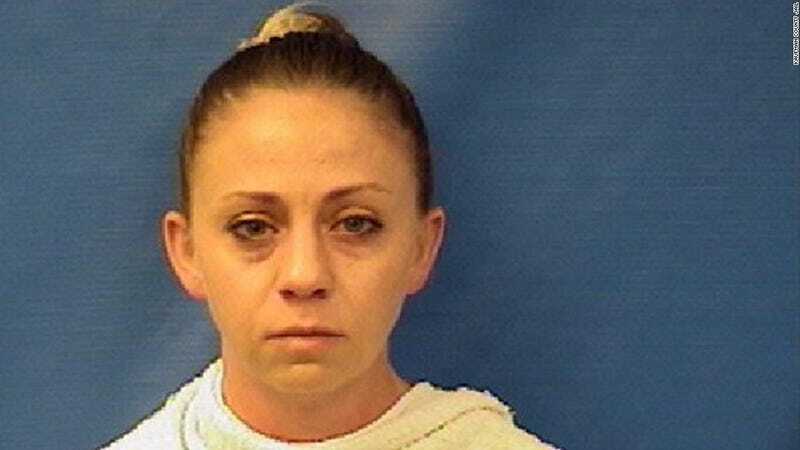 Amber Guyger, the Dallas police officer who reportedly shot and killed 26-year-old Botham Jean in his own apartment on Thursday night, turned herself in to Dallas Police on Sunday evening. According to the Washington Post, Guyger turned herself in at Kaufman County Jail, where she was arrested and taken into custody on a manslaughter charge for killing Jean, her neighbor. Police say Guyger mistook his apartment for hers, though it’s unclear how she would have made the mistake and how the shooting would have occurred. A recently released video shows Guyger moments after the shooting occurred. She can be seen pacing back and forth down the hallway of the apartment building on her phone. Later, a gurney can be seen wheeling Jean’s body out of the apartment, as officers follow behind. Although Guyger was in uniform at the time she killed Jean, Dallas Police Chief Renee Hall said Jean’s death isn’t considered an officer-involved shooting because Guyger was off-duty at the time (she was returning home from her shift). According to police, Guyger, a four-year veteran of the force, fired her service weapon at Jean, thinking he was an intruder. Afterward, she called 911. Jean died at the hospital, reports the Post. Many have voiced outrage over Jean’s death—and disbelief over both the official story coming from police and the subsequent manslaughter charge that’s been handed to Guyger. As the Dallas News reports, one Dallas official claims the three-day delay between Jean’s death and Guyger’s arrest happened because a judge refused to sign an arrest warrant unless it was for murder. On Sunday, city councilor Philip Kingston wrote on Facebook that alleged that unnamed judge refused to sign an arrest warrant for manslaughter. “On Friday at around 7:00 a.m. DPD determined that this was not an officer involved shooting (‘OIS’) and decided to seek an arrest warrant, but there was an internal disagreement over whether to charge the crime as murder or manslaughter,” Kingston wrote. “Someone apparently wanted the officer charged only with manslaughter; so DPD called a judge who told them he would not sign a warrant for manslaughter because that wasn’t the crime they were describing. But he would sign a warrant for murder,” he added. Kingston also alleged that, because the judge wouldn’t sign the warrant, Dallas police were forced to ask the Texas Rangers to investigate the case. In a comment to his post, Kingston didn’t name his sources, but said that it didn’t come from Dallas police. Dallas Mayor Mike Rawling and Police Chief Hall both vociferously denied the allegations. Rawling called Kingston’s comments “categorically wrong and dangerous,” according to the Dallas News. Rumors had also swirled that Jean and Guyger knew each other, and may have been romantically involved. Jean family attorney Lee Merritt told the Post Jean did not know officer Guyger, and that he had lived directly below her apartment. On Sunday night, Merritt told reporters that he recently presented a witness and video evidence to the Dallas district attorney’s office that could “change the course of the investigation” and secure an arrest. Guyger, who is still on administrative leave from the department, is currently free on $300,000 bail.